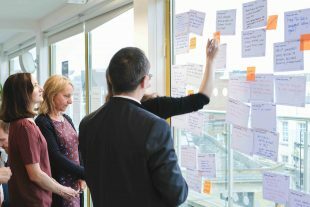 A few weeks ago we spent a productive day co-designing possible interventions which might help improve experiences of the private rented sector (PRS). With an incredibly energetic group of people representing tenants and landlords, we shared insights from ethnographically-inspired research and early prototype testing. This allowed us to come up with a range of ideas. We can’t wait to go out and test them. Housing sits at the top of the government’s agenda. In February, the Department for Communities and Local Government (DCLG) published its White Paper on fixing our broken housing market. That White Paper sets out the government’s intention to increase housing supply by making more land available, speeding up the building process and diversifying the market. The tragic events at Grenfell Tower have, of course, brought these issues to the fore and caused us all to reflect on what more can be done to ensure good quality, safe and secure housing for everyone. It is the PRS that DCLG approached us to help with. They wanted to explore what could be done in the short-term to improve landlords’ and tenants’ experiences. More and more people now live in the PRS. Many renters are only just managing to cover their costs. In the 10 years from 2005/6 to 2015/6 there are around 945,000 more households in the sector with children. At those sprints, the groups came up with a range of possible interventions, sketching their ideas, sharing and rapidly iterating. We took those early ideas and developed a set of low-fidelity (really simple) prototypes (see this blog on prototyping). Testing these prototypes – from a mocked-up web page giving new regulations to a staged online chat discussing the policy – gave us invaluable insights into tenants’ and landlords’ perspectives. We learnt a lot about what might work and what might be totally disastrous! Before developing prototypes further, we needed to get closer to the lived experience of those in the PRS. No matter who we are, we all hold tacit assumptions and experiences which shape our views on what should, and could, be done. Working with Ella Fryer-Smith and her team of ethnographers, we went out and spent the day with ten tenants across England, filming them in their homes going about their daily lives. We also carried out in-depth interviews with four landlords with different experiences. We chose a range of tenants and landlords from different life stages and of different ages (families and non-families). Of course, this is only fourteen people, and we recognise that there are many different experiences that we were not able to capture. But we learnt a huge amount and have a great starting point to design possible interventions based on real people’s experience, which we can then test with a wider group. Working with the design agency Snook, we translated the findings from the ethnography into persona posters, which we used at the workshop to help participants design possible interventions with users always in mind. Personas are pen pictures of people which help us to build empathy. Participants could choose to work with fully developed personas – inspired by the research – or to create new ones, especially if they felt a particular user group was missing. Only once we were immersed in the lived experience of our user group were we ready to develop our ideas for what kind of interventions might support them. The participants chose four of these themes to focus on in more detail: how tenants prove stability; landlord responsibilities and repairs; families in the PRS, and tenant support. To help participants frame, refine, and develop the key aspects of their ideas, Snook brought a great idea card (photo below) which drew out how these policies might be delivered – and who they would help. 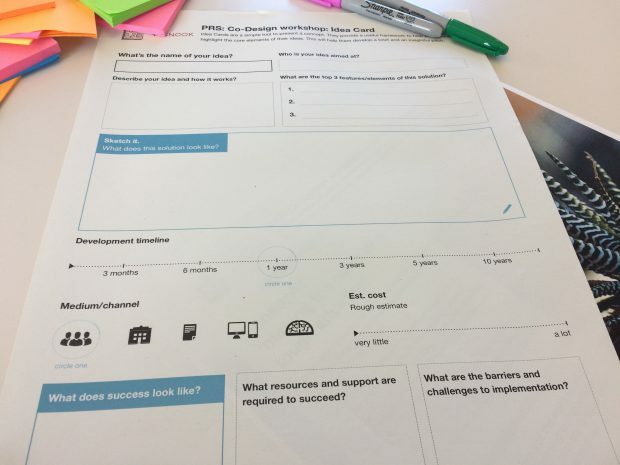 Idea cards are a simple tool to quickly think through ideas, considering key aspects such as: minimum viable features, development timeline, delivery channels, target users, costs and the resources needed to bring an idea to life. 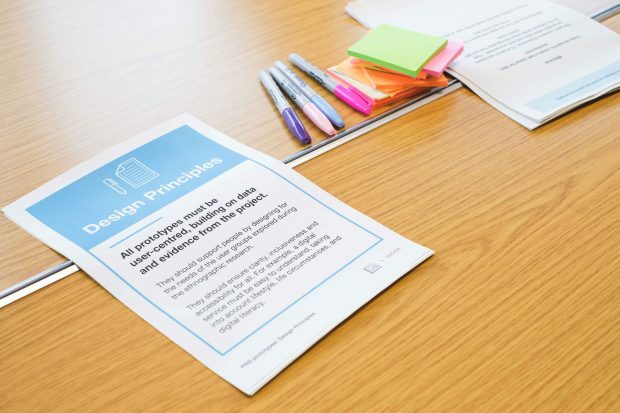 No policy idea will be ready until we have tested it – and it is incumbent on the design and prototyping process to test with as broad a range of users as possible. Snook have gone away to work up participants’ ideas into working prototypes which can be tested. We asked participants specifically for views on who we should test the prototypes with and what we want to find out. The co-design day taught me something about being flexible to changes throughout. We were not wedded to design principles, particular target groups or prototypes. We let anybody change the materials – so long as they had a justification. It was incredible what you can get done in a day with a flexible approach! We were lucky to have such an enthusiastic and energetic group of people in the room. Co-design sessions can be very intense and sometimes people are a little overwhelmed and need encouragement from facilitators. This was definitely not the case here. The level of engagement throughout the day proved that there is an eagerness to embrace innovative and inclusive design methods to solve some of the toughest challenges burdening the PRS. We received valuable feedback too: participants were clear that we should include a broader range of people from more diverse ethnic backgrounds in the testing phase. We will make sure this happens, to help ensure that the ideas developed are inclusive and truly useful for a wide range of people.